11. Ignoring an opponent’s breach of Rule (Rule 1-3). In match play, you do not have to call a penalty on your opponent if you witness a breach of Rule by them. Special Offer! Purchase either of my 999 Questions eBooks (receiving both .pdf and Kindle formats) and receive a free copy of ‘999 Tips on Using the Rules of Golf to Your Advantage’. Click here for information on the eBooks and prices in $, £ and €. First of all thank you for your excellent columns again and again. A question regarding item 11 of the above. Why do you write that discussing a breach after teeing off at the next hole, but during a round obviously, is allowed? I can't find that in the rule, nor in the decisons. Rule 2-5 states that no claim may be made after any player has played from the next teeing ground. In match play a player may ignore a breach of Rule by their opponent. However, during play of a hole, if a player tells an opponent that they have just breached a Rule, but they are not going to apply the penalty, both players are guilty of agreeing to waive a Rule of Golf if the penalty is not then included. Regarding item 12, I assume this means that, in the absence of a ruling, the match should be continued until a definitive result is known regardless of the outcome of the ruling. Is this correct? In an extreme case it could mean that a match is won 6&5 given one ruling, and lost at the 21st given the other. It must be very difficult to continue to play out a match in that circumstance. Yes, that is exactly the point that I made in my last sentence; "If a timely official ruling is not received, the match should be continued and played to a conclusion whereby there is a definitive result, depending on whether the eventual ruling for the disputed hole was won by either side, or was halved." Of course one of the players could always concede the hole, or the players could agree to halve it, if they did not wish to continue playing to a definitive result in the absence of an official ruling. Your 6&5 or playing to the 21st hole scenario is extremely unlikely, but possible. Thanks, Barry, as usual you explained these obscure interpretations in a way that I could understand them! Thank you for your answer, Barry. To make sure that I understand it well. In a match A, when playing his ball out of a bunker, touches the sand in his backswing. His opponent B tells him immediately thereafter that he ignores this fault for now, but will claim the hole the next time it happens. Both should be disqualified. But if B would say this after both have teed off on the next hole, there is no penalty. Is this understanding correct? Haven’t they agreed to waive a penalty, in the latter case too? 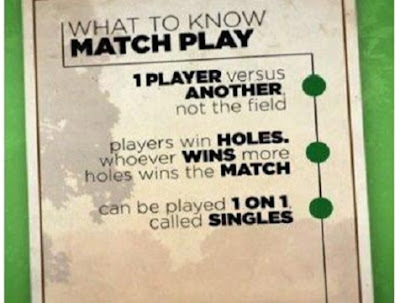 In the second scenario, there was no 'agreement' to waive a Rule; one player was informing their opponent that they had chosen to ignore a breach on a previous hole, which is their right in match play. This came a the most perfect time. As I was creating a list of Match play strategies and rules for our B and C teams since there have been problems with 'bullies' during play as well as having some of these rules explained through examples. Thanks for putting this together! I did cover playing out of turn in point 5. Also You are not right in saying that the player farthest from the hole MUST play first. In tap-in situations, or where a player is nearer the hole but off the green, e.g. in a bunker, the player often asks their opponent if they may make their stroke out of turn and may do so once they have received authorisation. Also, where no such authorisation is sought the opponent may still choose to ignore the order of play breach, should they choose to do so, e.g. when the other player has made a bad stroke. Thanks for that clarification Barry, I was convinced (reinforced by numerous measurements and pacings) that under no circumstances could a player - in match play - play first if closer to the pin. The reason given by the local rules official that it would give unnecessary advantage to the other player (speed of the green etc. Good to know. Thans again for the wonderful blog. I really enjoy it.